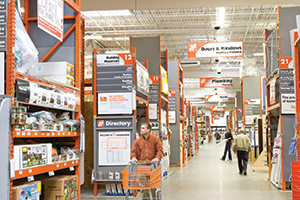 PureBond® Plywood Available at Home Depot Across the U.S.
PureBond® panels are made right here in North America. They are available in stock to DIY’ers and small contractors at most Home Depot stores in the US and Canada. * But you should insist on PureBond quality when you buy cabinetry or furniture through your kitchen and bath shop or dealer. Not sure where to find PureBond at a location near you? Try our Where To Buy PureBond® location finder. Check with your local Home Depot retailer for more information on which PureBond products are carried in stock or are available for order. * You’ll find the finest professional-grade, American-made veneer core hardwood plywood suitable for cabinetry, built-ins, furniture, and more. In most Home Depot stores, you’ll find Red Oak and Birch plywood in stock and ready to use. Standard sheets are 4′ x 8′ and come in 1/4″, 1/2″ or 3/4″ thicknesses. They’re perfect for Do-It-Yourselfers or small project shops. It’s the natural choice if you want the warmth, beauty and timeless quality of hardwood in cabinets, furniture, wall paneling, shelving and storage solutions, media centers, built-ins, headboards and more. Better yet, there’s no minimum order requirement… and your PureBond® order is shipped right to the store! Ask your Home Depot ProDesk associate for lead times and pricing information for all special order products. Be sure to use Special Order SKU# 226-917. For the trade: click here for wholesale distributors. *At this time, PureBond plywood is not stocked or offered through special order in The Home Depot stores in AK, AZ, CO, ID, NM, NV, OR, UT, or WA.